The plan was for my wife and me to visit and take photographs in four contiguous U.S. national parks – the Grand Canyon, Arches, Zion and Bryce - in seven days. We have visited Bryce and Zion before but it was going to be our first time to visit the Grand Canyon and the Arches. This is my reminiscence of my first visit to Grand Canyon. Grand Canyon being the nearest (relative to the other three parks) from Los Angeles was our first stop. We had to choose between the North Rim and the South Rim of the Grand Canyon. We could not visit both as it would take a five-hour drive of 215 miles to get from one Rim to another. Crossing by car the almost one-mile-deep Canyon that bisects the North and South is not possible. Hiking from "Rim To Rim" is a 21-mile grueling overnight trek. While traveling to either Rim will take about eight hours coming from Los Angeles, we chose the North Rim as its 121-mile distance from Zion is less than half the 249-mile distance from the South Rim to Zion. Eight thousand feet above sea level, the North Rim sits atop the Kaibab Plateau. It has lush green meadows covered with conifer and aspen trees. The deer and flock of turkeys that we saw several times on the road are a common sight in this part of the Grand Canyon which is less-visited compared to the South Rim. (Ninety percent of the nearly five million people who visit the Canyon view it from the South Rim while the rest view it from the North Rim.) Each Rim’s fascinating attraction is the mile-deep canyon that has been carved by the Colorado River and by incredibly long years of weathering, erosion, volcanism and other forms of geological transformation. 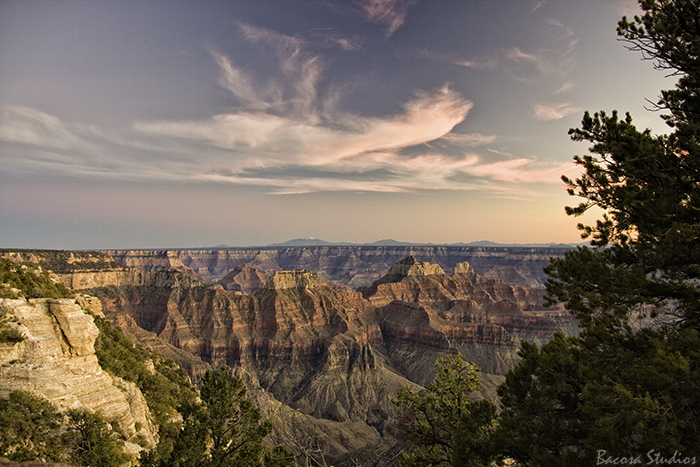 The Grand Canyon is 277 miles (446 kilometers) long and up to 18 miles (29 kilometers) wide. We went to the North Rim just at the nick of time. Visitor lodging and food services inside the North Rim which opens from mid-May was about to close that mid-October. As we entered the Park Ranger-guarded entrance of the North Rim, the first item in our checklist was to buy an $80 National Parks and Federal Recreational Lands Pass in lieu of paying a $25 entrance fee every time we enter each of the four parks we were visiting. This $80 annual pass investment would not only save us $20 dollars for this trip but it will allow us to save $25 dollars each time we enter a national park or federal recreation land for the next 364 days. We have made sure our car’s gas tank was full before we entered the North Rim entrance. We already had lodging reservations a week before our trip and resting right away at our lodge was not what we travelled eight hours for. Our immediate goal which was the second item in our checklist was to take a look before the sun sets at the most accessible viewpoint that provides beautiful photography opportunities. For the North Rim, that go-to viewpoint is the Bright Angel Point which can be approached through entering the Grand Canyon Lodge. As I walked towards the Bright Angel Point, my fear of heights fused with my feeling of awe at the sight of the enormous 270-mile long and 8,000-feet deep Grand Canyon. I knelt on the cemented trail not caring at all if other visitors noticed me and bowed my head to the magnificent spirit I felt one with as I entered the majesty of our Creator’s kingdom. Saying more words cannot sum up what I reminisce as lucid as sharing pictures of what I saw. Through my photographs, I share as well the spirit I felt in Grand Canyon hoping that you too would value nature’s gifts.